THE covenants discussed in the following pages, connect themselves with true religion in every age. I have studied them carefully, and with much satisfaction. The sketch now presented has, I confess, cost me no little labor; but it has aided me in acquiring a still more full) and perfect knowledge of the word of God. In the hope that it may confer a like benefit upon others, it is sent forth to the world. May God, our heavenly Father, make this little volume a blessing to his cause, and people, through Jesus Christ our Lord. Richmond, VA., January, 6th, 1855. 2. THE COVENANT OF WORKS. 3. THE COVENANT OF EDEN. 4. THE COVENANT OF REDEMPTION. 6. THE COVENANTS OF THE LAW. 8. THE OLD COVENANT AND THE NEW COVENANT. 9. THE TEACHINGS OF THE COVENANTS. 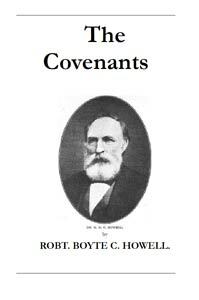 R. B. C. Howell, the second president of the Southern Baptist Convention, presiding from 1851 through 1858, is described in Cathcart's Baptist Encyclopaedia as" one of the ablest and most learned men in the South." In addition, the encyclopaedia claims that "no one exercised a greater or more beneficial influence within or outside of the church. His life was unspotted, his Christian course was marked by the highest virtues. His courtesy and kindness of heart made him a universal favorite, notwithstanding the fierce theological debates in which he was often engaged." The "fierce theological debates" in which he was engaged were threefold. His first conflict had to do with the intrusion of Campbellism into Baptist life in Nashville, virtually destroying the First Baptist Church of that city. In 1835, when Howell came to be its pastor, he led in restoring respect and honor to the Baptist name in the community. In addition, his leadership led to the construction of a beautiful building for the worship gatherings of the church. His second conflict was with the anti-missionary forces of Tennessee and Northern Alabama. These forces responded negatively to the formation of the General Missionary Convention and the work of its most notable agent, Luther Rice, referring to him as a "modern Tetzel." In addition to the ecclesiological objections they held toward centralized organizations, they discountenanced some of the methods used by the agents, declaring them to be Arminian in methodology, thus denying their Calvinistic heritage. Eventually, however, the anti-mission society movement degenerated into pure hyper-Calvinism and denied the validity of giving a free offer of the gospel to all men, railed against theological education, and viewed Bible societies as totally unwarranted by the Word of God.